A cleft lip and palate...what now?! 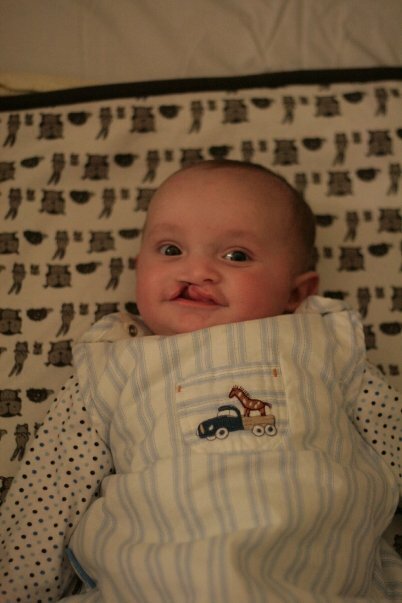 Our journey from diagnosis to surgery and beyond: Do not terminate your pregnancy because of a cleft! Do not terminate your pregnancy because of a cleft! Since 2002 there have been 40 pregnancy terminations in the UK after a cleft (lip and / or palate) was diagnosed. 7 in 2010 alone. So, for anyone that made that unspeakable choice and, more importantly, those less selfish people who've had 'the news' and decided rightly to crack on, here's a photo I took yesterday of Jake on his third birthday. For balance, here's a photo of Jake at his most clefty just in case you think his was one of the subtler kind. As you can see, the cleft is all the way through his lip and the right side of his nostril has collapsed because there's nothing below to support it. What you can't see is that the cleft goes through his gum and all the way to the soft palate at the back via the hard palate at the front. Whilst the lip will initially be the most worrying thing as it's so visual, the palate is perhaps more important. Since having Freddie we've realised that perhaps Jake's cleft did affect him more than we were told it would. For starters he cried a lot more, slept a lot less and drank milk so much slower. Then weaning took forever. He was our first so we had no frame of reference but compared to Freddie, who in his second week weaning, eats more than than a small horse, Jake obviously found it much harder going. To be fair, he had a bloody great hole in his palate which can't have helped. Anyway the point is, he had that hole fixed and eats like crazy now. 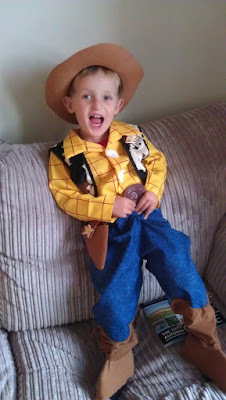 His speech is fine and improving all the time and he's a brilliant, healthy, happy and handsome boy (obviously :-)). We never for one second considered the option of 'getting rid' of him, although amazingly it was referred to as a possibility. I can see how either the very young, poorly advised, naive or vain might consider it, but I think it's unthinkable. And I'm not anti-abortion. I'm very much pro-choice as long as it's done in the right spirit if that's the word. If you asked my advice had the news been cerebral palsy or even spina bifida, I'd probably say that you'd be better off thinking about yourself and how you'll cope. There will be people who've nobly gone through with having babies knowing that they'll have serious mental and physical disabilities, who have coped well and whose children will have lead as fulfilling lives as possible. I salute them I really do, but I'm not sure I could do that. I'd feel a martyr and actually I am quite selfish like that. The point is, it wasn't a selfless decision to not abort Jake because it wasn't a decision at all. We were told he'd be born looking a bit different and he'd have a few operations (like most kids will have for various things) and then he'd be fine. And that's exactly what happened. I'm fairly sure anyone who aborted a baby because of a cleft will have felt guilt about it and, whilst I'm sure they'd justify their actions all day long, I hope they realise, especially after seeing the photos above, there could have been another way. One where an amazing kid grows up before your eyes totally oblivious of the issue he was born with and one where he'll thank you a million times over later that you let him have a brilliant life (with any luck). A chap from India emailed asking for advice as he'd just had the scan and received the dreaded cleft news. He was in a hurry as they only had a few days left to decide whether or not to abort. All the medical advice they'd received was to terminate. And that's the difference between the NHS and poorer parts of the world. That it's still seen, even by educated medical professionals, as an untreatable issue which will cause a lifetime of worry, stigma and ostracism, proves we have a long way to go and just another reason to be greatful for the work that Smile Train does. I emailed back right away to implore him to keep the baby and tried to explain that all will be well, but also said I wouldn't judge him either way as I have no idea how things are dealt with in India. It's easy for me to dish out advice having received, arguably, the best treatment available anywhere in the world. Anyway, if you're reading this, I hope that whichever decision you made it works out for the best, whatever that is. +1000. We have honestly forgotten about the cleft. All we have now is just a sweet little boy, who has a bit of a scar which will no doubt impress the ladies when he is older. Thanks Tanya, glad all is good for you too! Thanks for sharing this blog. Great lesson for those parents who has the same problem with yours. We adopted a boy with a cleft lip/palate. I so agree with you it is not a reason to terminate a pregnancy. Had his birth mother not carried him full term we would not have our amazingly handsome son in our life. good for you, it's good to know that for everyone prepared to give up on someone, there's someone else waiting to help. Merry Christmas!